Includes some targeting bug fixes i.e flintlock. Experimental changes to dancer and bard. I have been playing through this hack (In hard mode) for a while and decided to ask a few things. First, why Aero and Water are so expensive if they are basically Blizzara? All units that can cast this spells are slow, sometimes they die before even casting the spell once (happened with a Bishop twice). Is Cura working properly? It doesn't feel like it's scaling by 1,25. If it is working properly, isn't it a bit too weak? Using it seems like a waste of MP for a spell just slightly stronger than Cure. How turbo-ether and megapotion work? You don't really explain what it does, and since it has uses I'm slightly confused. Last thing, what are the current growths? I think Turbo Ether is just an item only available to alchemists, as when I used it, I didn't have another use available. I assume it's the same for Mega Potion? Roundhouse use weapon elements and damage so can potentially be a lot stronger. You do also get white monks at the start unlike fighters being a locked behind ability and quest requirements. Maybe I'll add knock-back and see how well that works, and give whirl burst more effect. Any suggestions? Well, that's fair, I was using Wide Swing with Gladiator and a White Monk sub-skill set on a Bangaa, wasn't considering the Fighter. I think that it's fine how it is, especially since Seeq 'Zerkers need something different from the rest with Furore. The skills under "High Magic"
Tier 1 spells can be cast every turn with some mp left over. tier 2 spells every 2 turns and tier 3 every 3 turns. Mp also adjusted for some skills. Raptors loses bulwark and gain thunder flare. Some bug fixes to chocobos and Raptors whirlwind. Experimental fix to Soldiers learning some high magick. Damn, you crank these out quick. This hack looks great as a vanilla+ style of hack, I look forward to giving it a try in the next few weeks. As someone who's in the early design phases of an A2 hack themselves, I have a technical question. I noticed in the Thief's skill section, you listed the skill Sneak, which gives invisibility and evasion+. Have you tested this skill to ensure it works properly, and if you have, how did you format the skill? I ask because in my own experiments with the ability editor, I was unable to add the invisibility effect to any skill that didn't already have it in vanilla. So for example, if I were to add the invisibility effect targeting self to a random Thief skill, it would only half-work in game. The small 'invisible' text prompt would appear over the user's head as with any invisibility skill in the game, but they remained visible on the screen and were still targeted by enemies. I'm curious as to how you got that effect to stick. Thanks in advance for any help, good luck with the hack! Some spell effects are actually tied to animation data. You would find that in the 14th byte of animation data for invis skill is 0E. Also I was running out of skill space so I just reused Vanish. Ah, that makes perfect sense, I wouldn't have thought it was associated with the animation data. Thanks for the help! Been trying out this mod on hard mode as well. Just having problems with my assassin who can't equip guns for some reason even though some skills of the assassin are tied to them. When I try to equip them it just says the usual "units with this job cannot equip this item". Any reason for this? (Sorry for stubby english). That's because I forgot to save some of the changes made in the old patch. Most notably Paladins are a lot more durable. Seeq have generally stronger stats to make up for their mediocre jobs. Berzerkers have increased spd and move. Monsters and similar enemy units have their base attack set to 0 and their unarmed bonus increased to compensate, this has the effect of letting monster reach a higher attack cap. Skills has been modified to adjust to this change. Enjoying the mod a lot so far, I really feel like I found the right one for me. Got some extra info about the bug with Soldiers and Warriors gaining unintended support abilities if you don't already have it. Soldiers are learning "Halve MP" from Barong, and Warriors are getting it from the Samson Sword. Warriors are getting "Impervious" from the Falchion. I'm not far enough yet to discover if there's more than that though. I was really excited at first when I thought Luso had innate Halve MP so I started building him as a Keeper/Seer, until I realized it was just a bug. Still going to build him that way and resist the temptation of Halve MP and see how it goes! General balance seems good so far. I can't just breeze through quests anymore and have had some very challenging missions due to being underleveled. My Tinkerer is the only thing that keeps me afloat...those battles against other Auction House contenders are really challenging early on! I actually had to plan a strategy against Graszton Seaways (who challenged me even though I didn't get 1st place in the auction?) so I'm looking forward to what's ahead. Archer seems underwhelming so far, but maybe I'm just spoiled by how fun they were in Clan's Journey. Pretty much only keeping him around for Hunting later on. I'm excited about trying out Doublecast on Seers and Magick Frenzy on Red Mages, I think that's a great balance change to fix all the dumb stuff without removing those cool abilities completely. One complaint is that speed battles might be even more broken than they are in vanilla or other mods. In the first one "Veis, Assassin" against house Bowen, they took it to HP critical in about 3 attacks, and all I had to do was snipe the kill on my first real turn. The assassin never had the chance to do anything! "Wow, you really showed your stuff out there, going invisible and all that." It seems in general that enemies' equipment scales pretty rapidly, much more quickly than monster stats (at least in the early game). I actually have a fair idea on the support ability bug, just haven't gotten round to fixing it yet. Hume's gets access to Halve mp anyway. Dunno why you'd like archers in clan's journey and not this, they'd have basically the same skills. There's really not much to do for speed battles due to AI limitations. I finally finished up a 300-quest run of this mod. 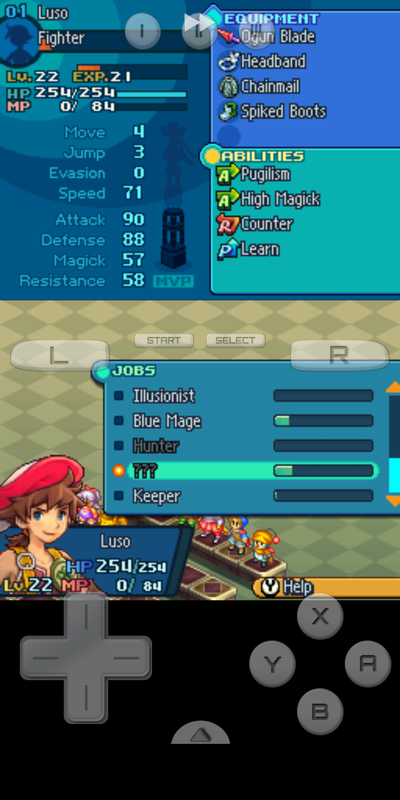 Luso/Keeper: Great overall class; the MP costs are high enough to stop you from spamming the strongest abilities. However, early in the game Free Energy is really powerful compared to the competition. Did you intend for Luso to have Elusion as a starting passive ability? It's really OP, especially against the Illua battles where she can take out half your party before you can move. It still leaves you vulnerable to Time Blade (although you can fix that with an accessory), but not much else. The one thing I kept wondering was what to pair this class with. I think I probably should have just stuck to Items since it does so much. Does anyone think otherwise? Adelle/Heritor: Thanks for buffing the Heritor's stats; I actually had a reason to level up and play as one for a change. The Heritor skillset still isn't too OP; I mostly stuck to dual wielding and used Lennart or Hilo when I couldn't get close enough. Similar to the Keeper, I wasn't sure what to pair this job with. Small nit: Lennart (and Scathe) have a 100% accuracy rate. Is that intentional? Bard: I wonder whether Angelsong at 12mp is still too cheap; as soon as you get MP Channeling that's almost always my opening move. MP costs: While I get the reasons for adding MP costs to most things, MP Turbo sort of blows everything up because it's usually more effective to use a tier-1 ability that's under 20mp with MP Turbo than it is to use a tier-2 ability that's under 20mp without MP Turbo, and there are a lot of tier-1 abilities under 20mp, if not 10mp, even when using MP Turbo. Is there a flag that could prevent MP Turbo from affecting some abilities? Outside of one character I avoided it because it seemed cheap, but it's definitely an easy way to breeze through the game. Parivir: I think the fire/ice/lightning blades when hitting an elemental weakness (or using Geomancy to do the same) edge out dual wielding, but just barely to the point that it might not be worth it anymore (probably not if you also consider potential Counter damage). Doublecast: I think you should revisit which spells are able to be doublecast. I planned on a Blue Mage / Seer to doublecast blue magick, but when I finally learned everything and tried it out, I could only doublecast Quake. I get why that made sense for Magick Frenzy, but I think you should be able to doublecast almost all, if not all, of the Blue skillset. In vanilla Red Mages could doublecast Protect, Shell and Silence, which are similar to the buffs and debuffs in the Blue skillset. Trickster: can't learn Arise from the Cheer Staff even though it's listed as a Bishop skill on the item. This was the biggest bug I found in my playthrough. Alchemist: probably more of a niche job now that relies on Bio for damage and Toad for status. I briefly tried pairing it with a Sage to make use of Hi-Ethers, but it didn't seem necessary with Halve MP. 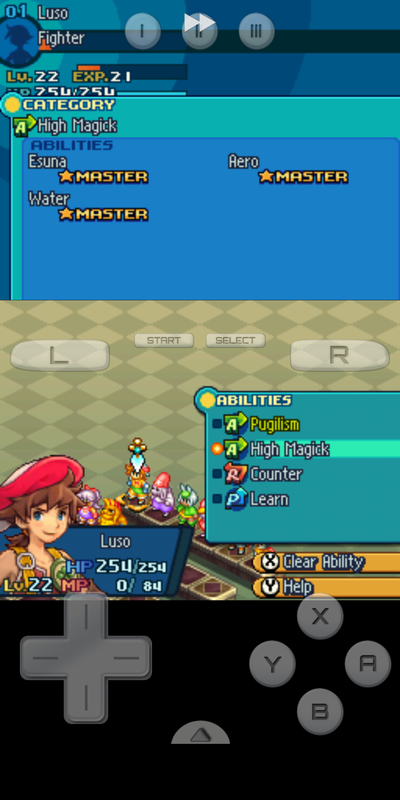 If I really wanted an item user, I'd probably slap Items on Luso or Adelle, as mentioned above. Magick Frenzy: I struggled with how to build a unit with this skill. I ended up leveling as an Assassin because it looked like they had the highest combined ATK + MGK growths, but I never got my character up to level 99 to try it out with what I think would deal the highest damage, which is to pair Red Magick with a Summoner and wield a high-attack staff. The tier-1 red spells just aren't strong enough to be worthwhile (unlike the tier-2 spells on the Seer combined with dual wielding in vanilla). Moogles: I feel bad about asking for more, but this race is still pretty useless, with the exception of the awesome Juggler and Bard skills. Its stat growths are meh, and more importantly, it doesn't have any good passives. These guys could really use a couple worthwhile passives, or a skill like Doublecast. Mog Knight: Hidden Mog is pretty underpowered, especially with its MP costs. Seemed like a downgrade from Ultima Charge. Raptor: This class became a one-trick pony for me with Thunder Flare, which, when combined with Unscarred, does obscene amounts of damage. However, without MP Channeling or that skill, the job is pretty underwhelming. I intended to level up my Raptor to 99 before flipping it into a Hunter with Devastation as a secondary, but never got there. The loss of the Raptor's other ranged options hurt it a decent amount (unless you primary with a ranged weapon). That's all I have for now. Thanks again! I just got up to Grazston and I've been enjoying this mod in Hard Mode! My only complaint was how in vanilla you don't get to make that much out of the bazaar until the last third of the game and wished how you could do more with it early on like in a Clan's Journey but then I got the Loot skill in the Camoa arc and feel satisfied, was hoping to loot items that would let me get weapons with Keeper skill but no luck. Would be cool to have earlier access to Grias and the fatty ones though. I also felt a bit resistance early on that Luso is more of a caster with Free Energy than a physical attacker but got used to it, I think I'm going to make him my doublecaster since that got moved to Humes. Soldier bugs aside, loving this so far! Sidewinder looks like it deals the same damage in the pre-attack estimate, but it follows up with a second hit not shown in the estimate. I had the same initial reaction as you. Not sure about Doublehand, never used it. He went from being an OP 300 damage plus statuses elemental melee unit in Vanilla to an OP 700 damage elemental caster unit, Doublecast Mist Charge/Recharge on first turn, next turn he has 70ishMP ready for doublecasting Flare Star, Aero, Darkga, Water or Cura. Plus can Raise and Esuna if needed. Early game he was my Thief making sure to Loot until Adelle joins and takes that over and begins to make the full transition to caster. Seer is really the way to go with Luso in this mod. Not much change from vanilla, except Thief is actually useful in this mod, always Vanish for Evade bonus at start of battle then go on to wreck hell with dual attacks, Lennart or Wermut from afar if needed though she rarely has a need to do ranged attacks. Not much change from vanilla either, the MP Battery and Smile support Hurdy is still just as viable. Moogles are alright early, once you get Air Render they're decent frontliners with 100% wool but lack of good damage modifier passives and lower stats than Bangaas makes them fall off. Once they get outclasses by Humes and Bangaas at meele units there's not much reason to use one until you get Hurdy. You can transform it into a Fusilier but won't make much impact. I change this unit depending on what laws are there or if I feel I need more support or more damage, likely the latter. With Doublecast gone the main thing for Vieras to keep up with Luso is Turbo MP, it turns Red Magic and Elemental Magic into -Aga strength spells plus extra sting from Rapier attack when paired with Magick Frenzy. I don't use Assassin for this because their abilities turn crazy expensive with Turbo MP, whereas Elementalists provide every element save Holy. Without Blood Price there isn't much point in using Assassin either I think, maybe a melee status condition unit paired with Spell Blade but Elementalist with MP Turbo does that much better, ranged and will most likely inflict the better status condition of them all instead: Death from 0 HP. edit: I forgot about Last Breath, you can make a murder machine like vanilla with Halve MP, use Vanish then have a 90% acc killing unit. You can compliment with Archer. Another cool unit that didn't make it to my final team could be Fencer with Turbo, makes puny vanilla Swamstrike into a 300 damage nuke for just 8 MP. The classic OP Paravir, I gave this to Frimelda and turned her into a holy damage tank. This one I'll change depending on mood, its role is to essentially give an Ether to the Viera and then give Haste to the rest of the team or support with some damage. Because Attack↑ and Pugilist don't seem to work I've found melee unit Bangaas pretty underwhelming, Cid has been benched for most of the game, I haven't gotten the armor for Unscarred to see if that one is any good. Was only doing decent damage during the mid-game with Bishop's Aero and Water but now I find better use in support with a Cannoneer. Just like vanilla, Grias and fatties join pretty late, by the time my party is 15 levels higher so I don't feel much desire to level one up to be able to see if this mod has made them any cool or worthwhile to use outside dispatching.